eBook Multiple Formats: PDF, ePub, Kindle, Daisy, Text, DjVu, etc. The approach of this text is to take learners through a progression of materials in order to develop skills of modular, structured programming. The text was written, for the most part, without consideration of a specific programming language. 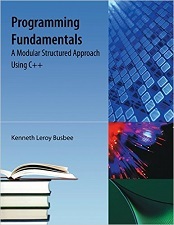 However, in many cases the C++ language is discussed as part of the explanation of the concept. Often the examples used for C++ are exactly the same for the Java programming language. Kenneth Leroy Busbee, a faculty member at Houston Community College in Houston, Texas.